SWLA was part of the team that renovated this former University of the Pacific student residence into market rate rental housing. The building faces south along the busy Post Street corridor in the Western Addition neighborhood. 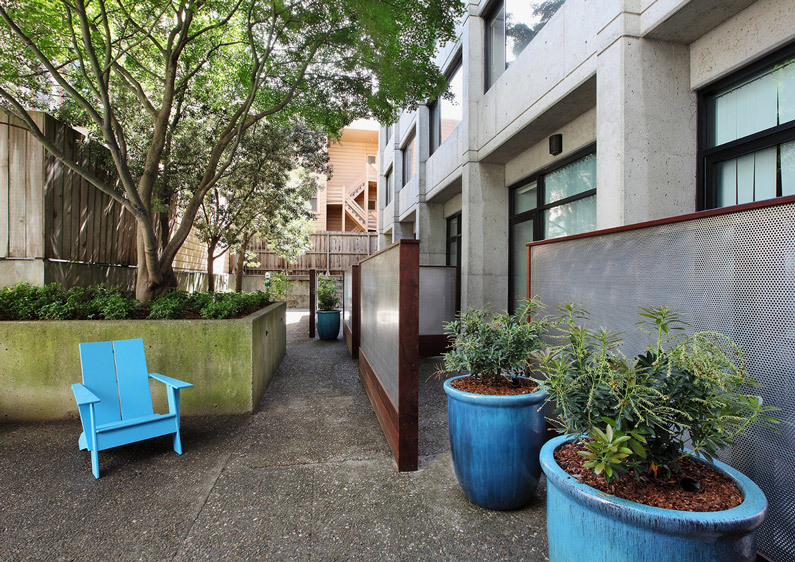 The back of the building has an existing parking lot and a heavily shaded outdoor courtyard. Improvements for the ground floor included a new lobby, a large community room facing the courtyard and 6 new units. New planting along the façade of the building highlights the building entry and provides separation for the new units from the street. Landscape improvements to the back yard include bamboo and hedges to screen views of adjacent buildings, and new planting and paving in the courtyard to create an inviting space for the residents. A series of Ipe and metal screens and glazed planter pots offer privacy to the ground floor units from the more public areas of the courtyard. Plant materials, including ferns and azaleas, were selected to complement the existing specimen Japanese Maple that defines this tranquil outdoor space.